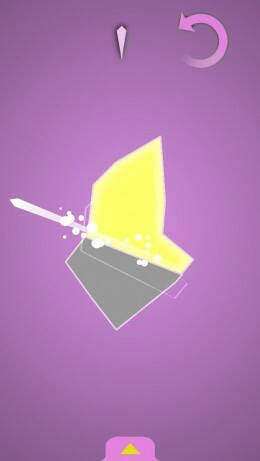 Perfection ($0.99) is a game about cutting shapes so they fit into polygon containers. Perfection is a game about cutting out everything that’s not necessary. Perfection is a game about cutting. Perfection is a game. Do you remember playing with tangrams in school? You would get a set of geometric pieces and you had to arrange them in such a way as to craft a larger silhouette that could only be made in a fixed number of arrangements. You had to see the pieces and the final shape and your brain had to make the connection between the two so you could solve the puzzle. Perfection is kind of like that in reverse. You’re given a shape and an outline and you have to make the shape you’re given fit into the outline. You do this by making linear cuts, slicing the shape into two pieces and getting rid of the smaller one. You can make as many cuts as you’d like to reach the goal, but there is a subtle cue on the top of the screen suggesting how many it should take. That’s the game. Shape, cut, fit into the outline, next level. If it sounds simple, that’s because it is simple. Perfection has no bells and whistles on it. There are no advertisements. There’s no leaderboard. There are no in-app purchases. There’s only one song, or what feels like only one song, that’s lengthy enough where you’re not quite sure if it’s looped or not. There’s no timer and there are no achievements that I know of. There isn’t much of a menu. Aside from the splash screen and the words “Success!” and “Perfection!” there aren’t even any words. With that, Perfection’s greatest strength, its simplicity, is also its greatest weakness. It’s a wonderful remedy for anyone who’s sick of social media sharing, in-app purchases, advertisements, leaderboards, and the like, but some gamers may want those things. After all, what’s the point in solving a puzzle if you can’t brag to your friends about how quickly you solved it, then challenge them to solve the same puzzle faster? The game becomes less about social competition, which has become the norm, and more about the isolated, exercise-like experience. That’s just it, though. Perfection is about letting go of all of that extra stuff with which games have become cluttered. You can’t even replay the same level twice; since Perfection’s levels are procedurally generated, once a level is complete it is gone forever. I personally found this to be a welcome change, ironically forcing me to let go of my perfectionist impulse to go back and get “three stars” or “100% complete” in a game’s levels. By simply not allowing me to do that, Perfection released me from what can be an enormous psychological burden depending on just how much there is to do in a game. Before you think, “It’s just a game about cutting shapes, so doesn’t that get old?” I should mention that there are actually two variant modes of play, each adding a simple but challenging mechanic. 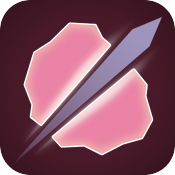 You start out just cutting fixed, stationary polygons. Once you’ve done that and succeeded enough at it, the game nudges you to try the next mode of play, which lets you rotate your shapes. Again, this sounds simple but it actually removes an enormous crutch by not making the game line things up for you from the get-go. 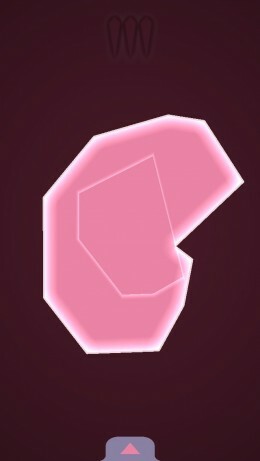 The third and final level of geometric complexity is when you can both rotate your shapes and resize them. When you think you’ve mastered cutting shapes, that third mode might just show you that you are not so smart, as it can be quite the challenge. Still, even on the game’s most difficult setting you have the choice to tap the “new level” button and be rid of a vexing puzzle forever, never having to think about it again. You never lose anything for skipping a level and the game puts no expectations on you to finish 100% of the levels given to you, so the only pressure to force a difficult puzzle on yourself comes from within. I found it to be a highly reflective and contemplative experience, showing me exactly what kind of gamer I am and what my tendencies are without ever having to spell that out for me. Perfection isn’t for everyone. Some will be captivated by its minimalism and others will be bored by it. It has minor mechanical flaws, such as not always calculating success accurately and handling a bit more smoothly on the iPad compared with the iPhone, but overall I found Perfection to be a refreshing, worthwhile experience. If the idea of playing with shapes and massaging your brain is at all interesting to you or if you just want a game that gives you a break from the accumulating minutiae commonly found in mobile games now, I recommend giving it a try.